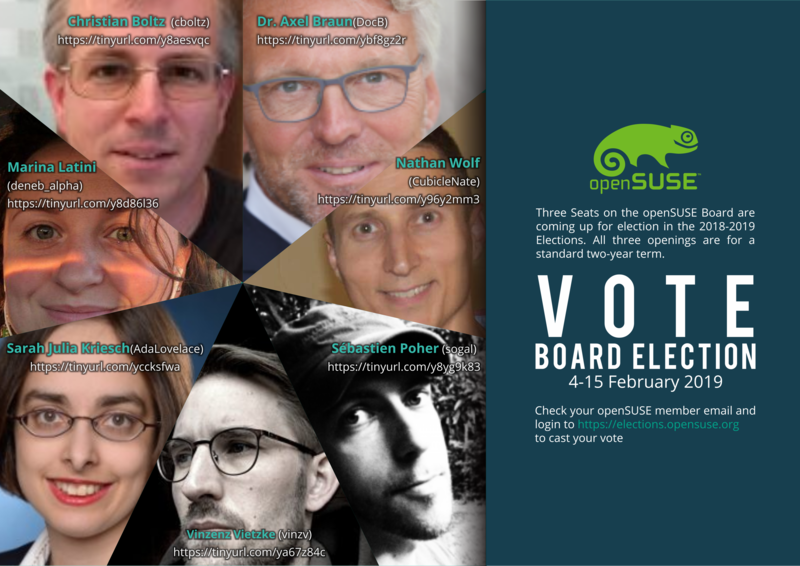 With only 11 days left to go until the ballots open on Monday, February 4, 2019, openSUSE News and the Elections Committee are running a “meet your candidates” series. Questions were sent out to the seven Candidates. The questions and answers will appear in the News, one Candidate each day, in alphabetical order. 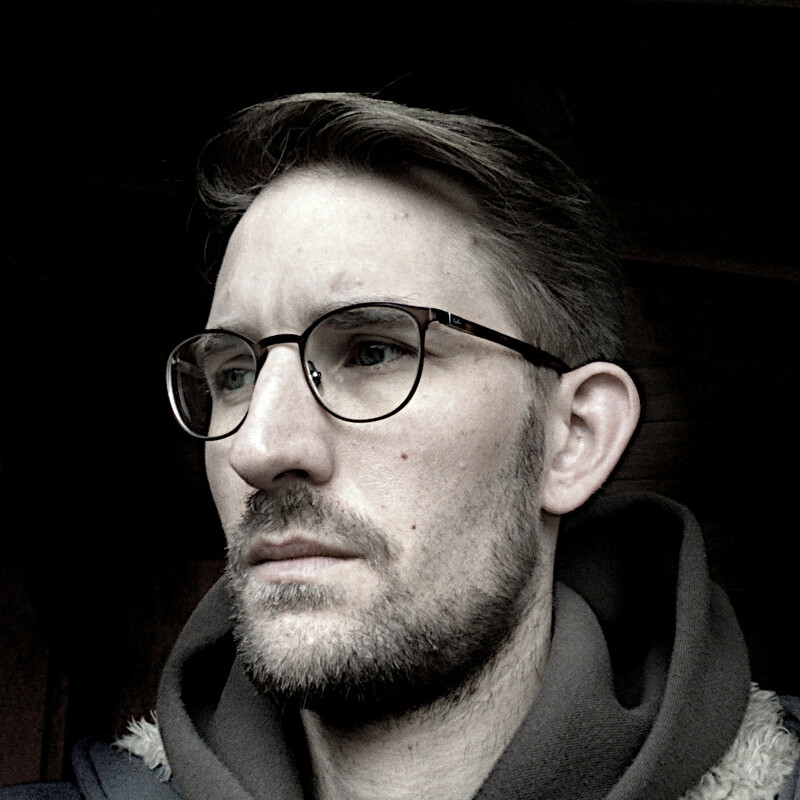 My name is Sébastien Poher, aka sogal or sogal_geeko. 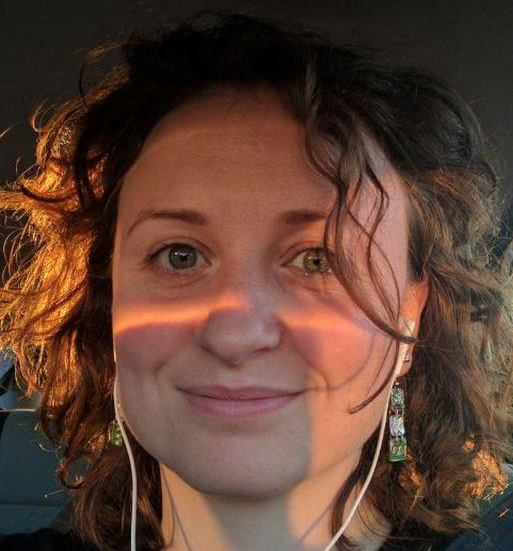 I am 35 years old now and live in France, between Lyon and Grenoble, where I work. I am a GNU/Linux system administrator, but this is a second professional life. 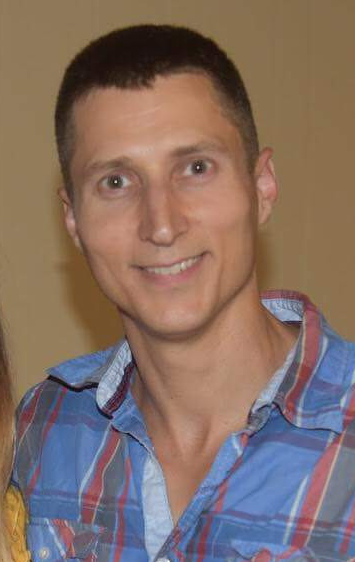 Before that I got graduated in logistics and transport and I worked as logistician in the civilian world and, during several years, in the French army. Right after that, I wanted to do something different and went back to school for 2 years in order to study system and networking administration. During the last 3 years, I worked for the IT service in an archaeological company where we have been using openSUSE for years on our workstations and some servers. I recently quit and join Probesys, a small cooperative company. 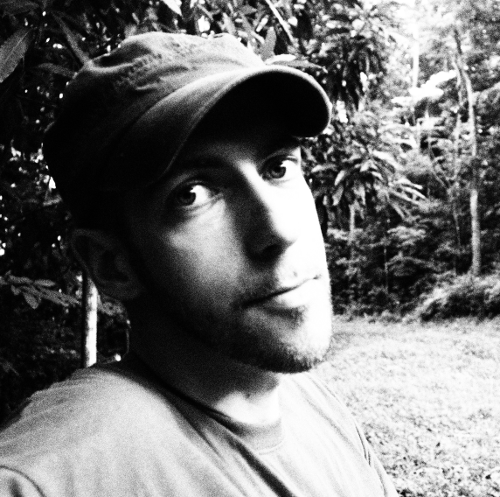 My first contributions were done amongst a Debian user community, called Debian-Facile (french for “Debian made easy”), as well as translator for FSF news and bulletin inside the April GNU-Trad team. I start using openSUSE (Leap) in late 2016 after switching from Debian that I used for some times but felt it did not fit my needs anymore. I was looking for a more balance and adaptable operating system. This is when I really and definitely fell in love with openSUSE. I start contributing in early 2017, thanks to the OBS, by packaging small utility software and I now maintain a dozen of packages. 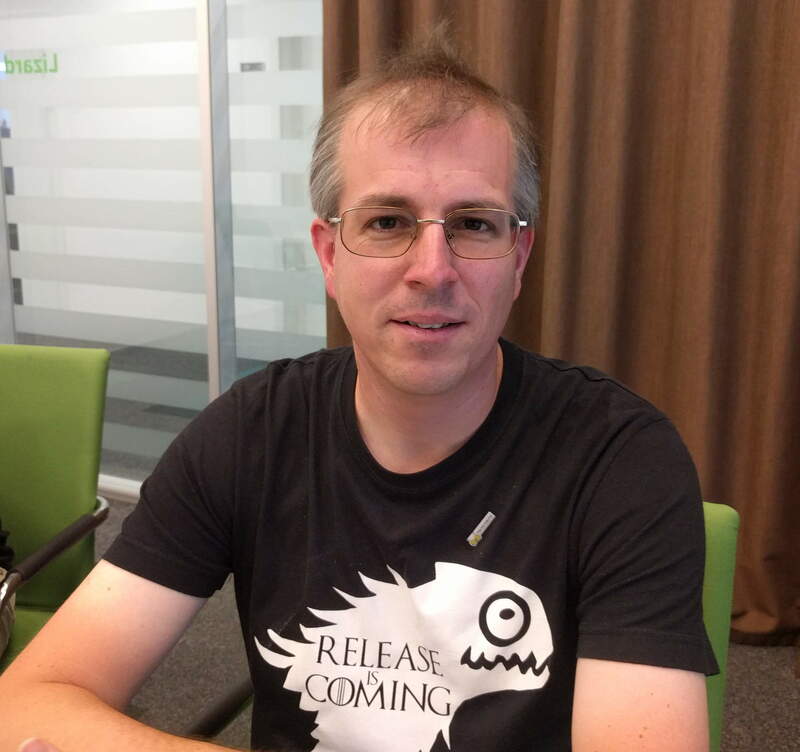 I am also involved in the French openSUSE community. I started to write articles about openSUSE in the Alionet (the name of a French openSUSE users association) forum, I translate project news and relay them in several social medias. In the “writing” part of my activities I have contributed to the French openSUSE wiki. 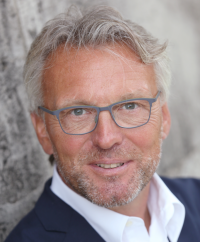 Last year I got elected as Alionet’s president and I am happy with it, there is quite a lot of work to do but we are a small group of motivated people and things are moving fine. In 2018, I also held openSUSE booths during 4 important FLOSS events and sometimes make openSUSE Project presentations. 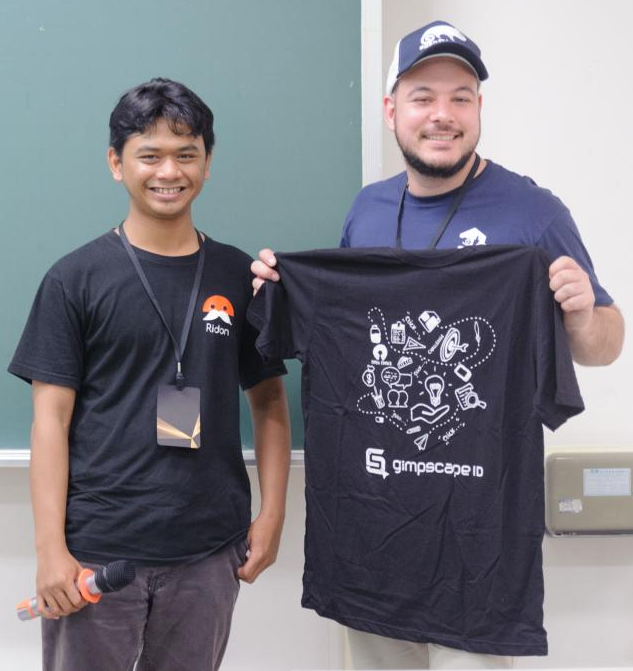 Such events are a good opportunity to meet old and new users, but also volunteers of other communities such as Debian, Fedora, Mageia, LibreOffice, April and to have some cross-community chats. I am also an apprentice drums player, I love stoner rock and metal music, craft beer, strangely flavored teas, mountain walks and vegan food. To be honest, I had no plan of doing so in the first place. You may know that feeling “No… I can’t do it, I am not a highly skilled developer, just a small contributor, blablabla”. Then I saw the announcement, stating that there was not candidate yet. And I thought “What if there is really not candidates in the end? Will the project will suffer from it or no? As a project member, shouldn’t I try to help more?”. I do not have children, I have spare time, I like this project and think it is sane and fun. So why not keep on contributing in a different way? My inner self could not find any objection to it, so I applied! As a Project, openSUSE is not only Leap and Tumbleweed, there are other sub-projects in it that deserve to be under the spotlight sometimes. I will also be happy to get in contact with local users groups and see how they can be involved in a process of translation and relay of this news. And, the other way round, I would like to have the project communicate more about what local communities are doing. Beside that, I do not fool myself: being a Board Member does not only mean having great ideas and being the super-hero that makes them real. A considerable part of the job is about less fun, administrative tasks such as writing tons of e-mails, organizing meetings, writing minutes and so on. That is sometimes an ungrateful job, but it needs to be done so that each and everyone in the project can focus on its own tasks. Well, because my sincere interest in openSUSE and my ability to deal with issues in a peaceful but steady and persistent way make me a good candidate. Through the diversity of previous experiences I had in professional and associative life, I have learned how to deal successfully with this kind of tasks. The openSUSE Project is wide and diversified and I believe the Board should represent this diversity. My various contributions show that I can be a good bridge toward the non-technical users sphere and that I have a clear view of what could be done to increase the openSUSE popularity amongst them. I was at the top of Mont Blanc at 8:00 AM on the 13th of August 2011 :) (and yes, I went there on foot). 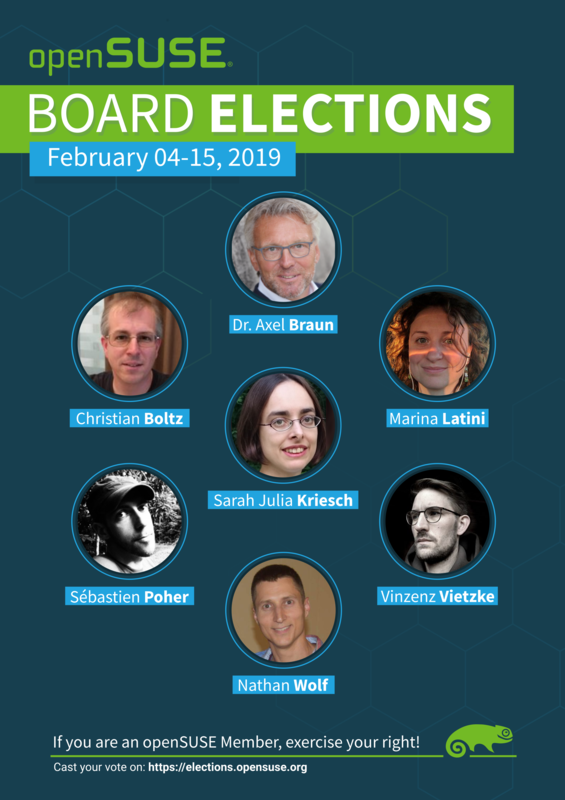 Elections for the openSUSE Board have been postponed until mid-April. Until then, the community can familiarize themselves with the candidates who are running for three available seats on the board. 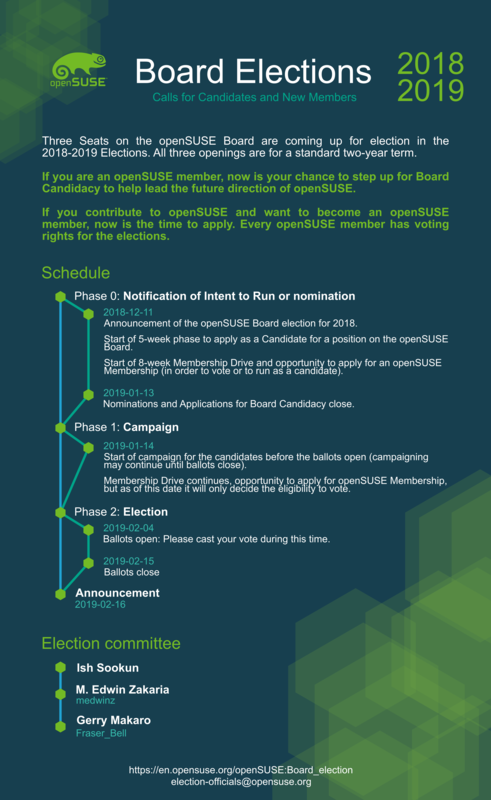 openSUSE Community Members can engage with the candidates directly or on the openSUSE-project mailing list if they have specific questions for a candidate(s). What do you think is the best thing about the Project at the moment? What do you think is the worst thing in the Project? If you are elected as a Board member how are you going to address it? What is one thing community members are unlikely to know about you? what would be your first act toward there if you get elected?